The purpose of the present study was to investigate the possible relationship between a change in Thr389 phosphorylation of p70S6 kinase (p70S6k) after a single resistance training session and an increase in skeletal muscle mass following short-term resistance training. Eight male subjects performed an initial resistance training session in leg press, six sets of 6RM with 2 min between sets. Muscle biopsies were obtained from the vastus lateralis before (T1) and 30 min after the initial training session (T2). Six of these subjects completed a 14-week resistance-training programme, three times per week (nine exercises, six sets, 6RM). A third muscle biopsy was obtained at the end of the 14-week training period (T3). One repetition maximum (1RM) squat, bench press and leg press strength as well as fat-free mass (FFM, with dual energy X-ray absorptiometry) were determined at T1 and T3. The results show that the increase in Thr389 phosphorylation of p70S6k after the initial training session was closely correlated with the percentage increase in whole body FFM (r = 0.89, P < 0.01), FFMleg (r = 0.81, P < 0.05), 1RM squat (r = 0.84, P < 0.05), and type IIA muscle fibre cross sectional area (r = 0.82, P < 0.05) after 14 weeks of resistance training. 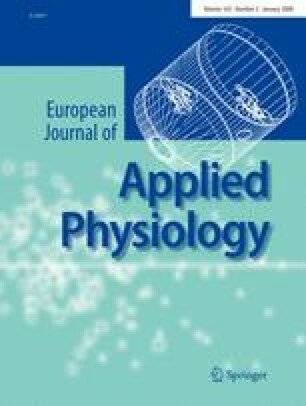 These results may suggest that p70S6k phosphorylation is involved in the signalling events leading to an increase in protein accretion in human skeletal muscle following resistance training, at least during the initial training period. We wish to thank Dr. G. Karampatsos and Mr. T. Kyriazis for their technical support throughout the training period. This work was partly supported by a grant from E.L.K.E. of the University of Athens to Dr. G. Terzis, Dr. G. Georgiadis and Dr. P. Manta.